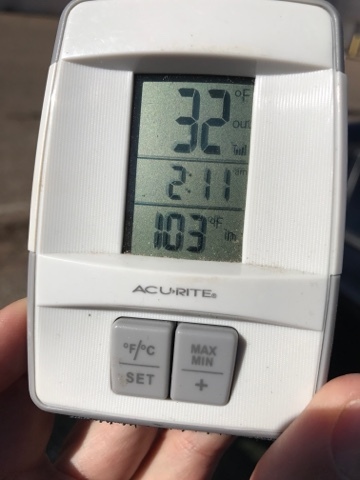 I knew the day would come that I would be gone all day and would have to leave the car in the hot sun and I would see how the LiFePo4 will hold up running my Engel Fridge. I parked my Prius at 0830 for a day-long flat water rafting trip down the Colorado River. It was in the low 70's outside at this time. 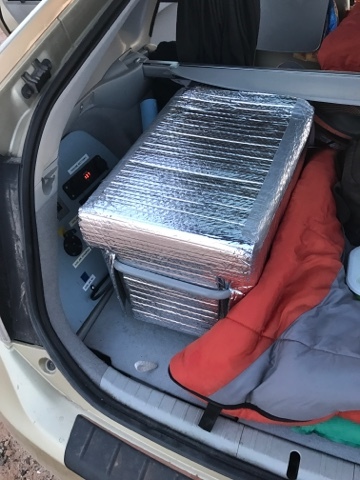 My fridge is wrapped on 3 sides with Reflectix and I pulled the Prius privacy cover with the compressor fridge plugged in to my fully charged LiFePo4 30 ah battery. 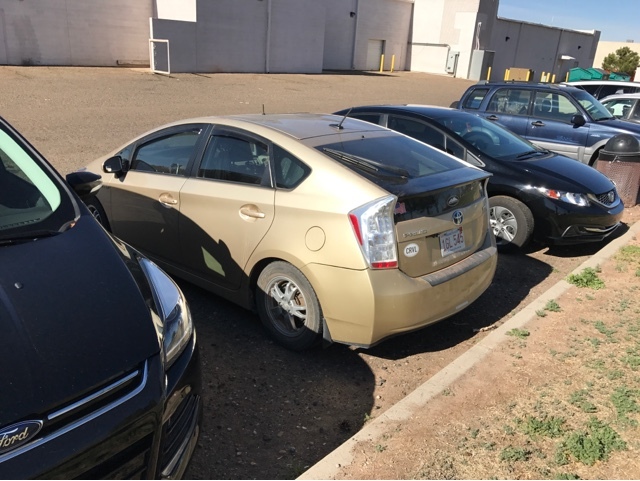 I returned back to the Prius at 1630 after 8 hours of the Prius being closed other than the 4 passenger doors cracked under the rain guards. It was 86 degrees outside when I returned to the car. 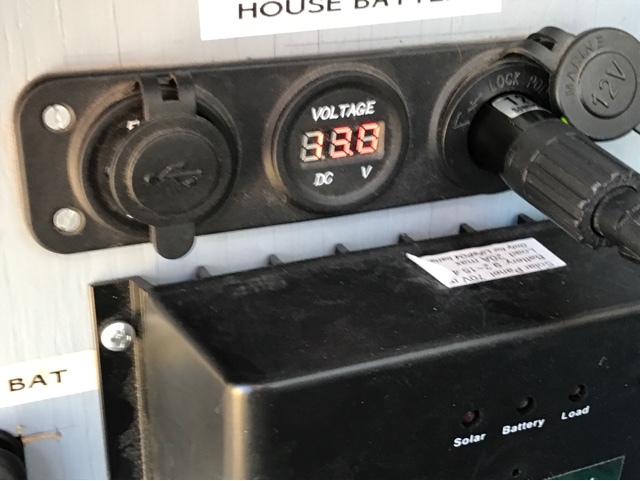 The picture is a bit washed out but the LiFePo4 battery reads 13.0 volts under load of compressor fridge running. In my glove box is my remote thermometer with sensor at the bottom of my Engel fridge. I was thrilled to see that it was 32 deg inside the fridge and in the glove box is 103 deg. I'm guessing that it was hotter near the fridge as the sun was shining more on that end of the car. Probably 110 deg from past experience. I should have put my second thermometer by the fridge. Either way I was thrilled that my Lithium house battery power worked exactly as I was expecting. My goal was to leave the car in the sun all day and still have battery power to get to where I had an opportunity to recharge the battery. I fully charged the battery that evening using solar for 3 hours. I still wish I had a sun roof to crack to help exhaust the heat and pull in the relatively cooler air from outside. I still like the one you have, it suits small vehicle living so well. Thanks for the links. The AltE is interesting in that it can be charged at 25 amps for 50 ah battery. I would need more answers about their specs. I would want to charge at 14.6 volts to get full capacity. Direct drop-Ins do not have this charge voltage until fully charged. A LiFePo4 solar charge controller could do it though. My Bioenno battery has balancing and I didn't see that AltE did and I feel this helps with longevity. I thought you might find that 25 amps charging current interesting. I agree, it would be best to have a completely programmable charge controller so you can specify your bulk and float charges. As time goes on, the consensus seems to change as to what is best for the batteries. "run a lane for comparison"? I like that the Bioenno has balancing too, and agree about it being good for longevity, unless the program glitches somehow and balances it wrong, which has happened and can hurt the battery according to Blars. I meant to say too bad I don't run a shop where I could do comparisons. It's not clear how balancing will pay off in the long run, but I decided to go with it. If I only could choose between power management and battery management I would pick the power management as it protects the battery from overdrawing the battery and damaging the cells, provided that's a feature. I don't think there is a PM standard to what it does. Thanks for the update Brent! It looks like you got what you needed out of your system. I'm thrilled that my LiFePo4 battery system is working as well as it does. I can be gone for 24 hours and not have a problem with power.